Kulfi is an unchurned eggless Indian ice-cream which can be made throughout the year but especially enjoyed during summer. You do not even need an ice cream maker to make kulfi. Traditionally, pure, rich & creamy milk is boiled down to reduce to half the amount. Various nuts& flavors are added to enhance the taste of the kulfi. The popular flavors of kulfi are malai (plain creamy), elaichi (cardamom), pista, badam (almond), kesar/jaffrani (saffron). Now, you may even find the fruity ones like fresh mango, chickoo, custard apple as well as vanilla, butterscotch & chocolate. My family loves kulfi all the year round. The beauty of this wonderful cool Indian dessert is that it is simple & requires very few ingredients. It can be made well in advance & served at a short notice. It is a pure wholesome & healthy dessert. It is an awesome treat visually as well as in flavor! Kulfi is traditionally sold on the streets in India, in small terracotta/earthenware pots/moulds (matka) & is known as matka kulfi. The matka kulfi has a lovely earthy flavor. In Maharashtra, you have street vendors with moving carts which has a box of aluminium with popsicle slots & a thin bamboo stick is inserted in the rabdi/basundi(kulfi liquid). The cooled liquid is frozen in these slots. The lovely aromatic cool toppings on the kulfi like the rose syrup & kewra syrup take it to another level altogether… I would say it is the ultimate!! There are quite a few popular places in Pune where the kulfi is good but was better years ago… As a child, I distinctly remember watching the ritual by the kulfi maker. He would fill the matkas & aluminium cones with the basundi & cover them tightly with rubber bands. The huge matka was filled with ice pieces & salt. He would then lower the moulds. The outer huge matka was wrapped with a red cloth. He would keep shaking the huge matka vigorously for about an hour. Then lo & behold! with great finesse he would take out the aluminium moulds, unwrap them, use a blunt knife to ease them gently out of the moulds on to steel plates, slice them, slather generously with some rabdi/basundi & finally with a generous helping of slivered almonds & pistachios. He would top it with rose syrup & kewra & serve with a flourish. The kulfi in the small matkas would be served in the container itself with all the generous toppings. There would be so many people awaiting their turn with patience. Believe me! I used to be so restless but with that pot of gold in my hands I would forget about all the waiting I had to do! Those cool discs in my mouth would be melting away & I would savor every spoonful & wish the moment would never pass by!! Today’s post is the evergreen Pista Kulfi with Falooda… Falooda is flavored sweet vermicelli/thin noodles which is prepared with arrowroot powder or corn flour. The falooda is flavored with thickened sugar syrup, kewra & rose syrup. Yellow or red food color is used to make it look attractive. The natural white color also looks good when you serve. It depends on one’s preference. The falooda vermicelli made at home is a little time consuming but is tastier & adds freshness to the kulfi. Dry falooda is also very easily available in the market which can be prepared quickly as per packaging instructions. In a deep thick bottomed pan, mix corn flour/arrowroot powder with water, salt & food color. Place on heat & keep stirring till the mixture starts changing to a slightly translucent, thick mixture & starts leaving the sides of the pan. Take the pan off the heat transfer the slightly hot mix into a sev maker/vermicelli maker. Squeeze out the noodles/vermicelli into a bowl full of chilled water filled with a slab/ice cubes. Let the falooda soak in the chilled water for about ½ an hour, undisturbed. Strain the falooda with a sieve to drain off excess water. Place in a bowl & add the flavoring i.e. rose syrup & kewra. Let it soak well to absorb the flavors. Serve chilled falooda with kulfi. Make a paste of corn flour & milk. Keep aside to use later. Break the bread into small pieces & run it in a mixie to obtain crumbs. Soak pistachios in warm water for about 15 mins. Grind to a thick smooth paste or coarsely. (Depending on your preference). In a thick bottomed deep pan, boil the milk & keep stirring constantly. After the first boil, reduce heat & let it boil further till it is reduced to half the quantity. Add the condensed milk, sugar & stir to combine well. Let it boil for another 5 mins. Add the bread crumbs & stir well. Add the pistachio paste, a pinch of salt; stir & cook for another minute. Add corn flour paste & cook till it thickens. Take it off the heat. Let it cool completely. Pour the contents in a blender & pulse to form a thick smooth paste which is called rabdi/ basundi. Pour out the rabdi /basundi in another pan & then add the cardamom powder & rose water. Stir well. Reserve some of the rabdi/ basundi for the topping & then fill in aluminium kulfi cone moulds/popsicles/matkas/any container of your choice. Freeze for at least 8-12 hours or overnight. It is better to make it in advance to allow the flavors to meld. To unmould dip the moulds briefly in water to loosen & scoop/ease out gently with a blunt knife on to serving plates. 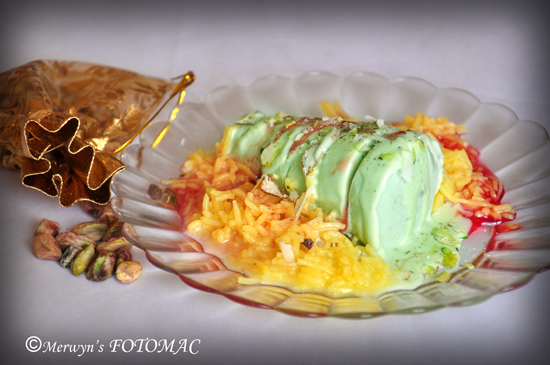 Serve topped with basundi, rose/kewra syrup, slivered almonds & pistachios along with falooda. Eat it immediately… before it melts away! We are still enjoying kulfis… I am enjoying the process of making, serving & relishing these sweet treats almost every day!